Do you find it a pain to sort your laundry colors? I know I think it's a nuisance at times. Purex has taken the time you spend sorting and given it back to you to spend on other important things, like yelling at the kids to bring you their dirty laundry. They have created a new detergent called the No-sort Laundry detergent and i'm a fan. 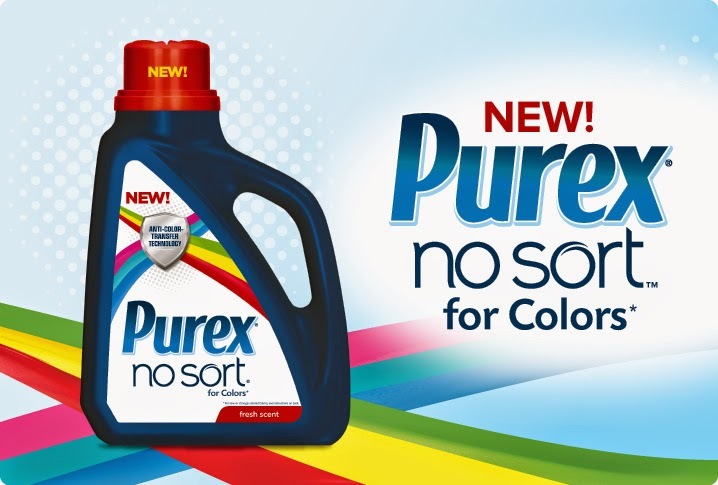 The way it works: The Purex No-sort works in both HE and Standard machines. It uses the Anti-Color-Transfer Technology, which traps loose dyes in the wash and prevents them from settling into other fabrics. I decided to get brave and try a new blue shirt and a while wash cloth together. The result was phenomenal. I am sold. Not one bleed onto the wash cloth and that's a risky dye, that blue. One of the most evil of all bleeders! I am sold. The Purex No-sort laundry detergent did a bang up job of making it effortless to combine laundry and not worry about colors bleeding into each other. Even though I went against their recommendation of washing new colors ( I'm a rebel ) and going so boldly as to add whites into the mix, it STILL did it's job. 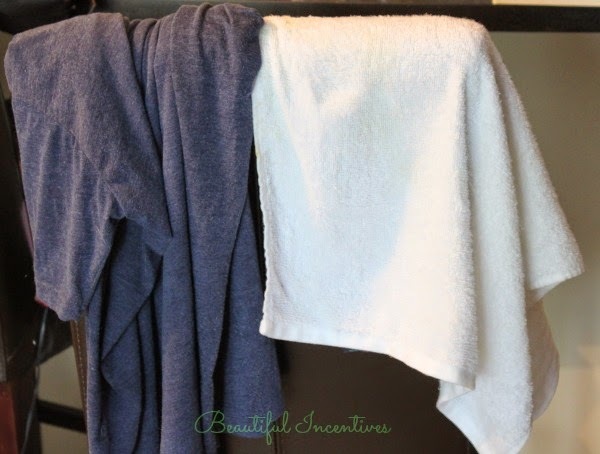 If you want to try the test out for fun, be sure to use something you don't mind getting ruined, like the washcloth I used. It's not a miracle worker and I haven't tried new red. I might do that next with the same wash cloth. If you don't feel as brave and I don't blame you, try it out in some clothes that have been washed at least 5 times and experiment galore! Will I use this all the time? Probably not. Some things are just too precious to risk, BUT it'll come in VERY handy for darks and mediums, which I will now mix those without sorting! Do you want to try it for yourself? Then enter the Rafflecopter below and/or Enter the Purex sweepstakes, where you have the chance of winning $1000!! There will be TWO winners for these coupons! Commenting is mandatory or you will be disqualified! I'm not brave to do that. I am not that b rave. I am not brave enough. im not sure i could mix the whites in, but ill try my yellows and blues and combos like that together! Yes, I think I am. If I used no sort Purex, I would try mixing reds and whites. I would try it with this detergent. There is one Twitter with no link? I sure would with Purex no sort, thank you for this chance to win!!! Probably not but we don't have much red clothes anyway! Maybe if I used cold water i could try it. i'm not sure that i am :/ depends on how many times the "red item" has been washed before!! Yes, because we use cold water and mix all clothes in together. Eek! I don't know, maybe if I also use cold water!